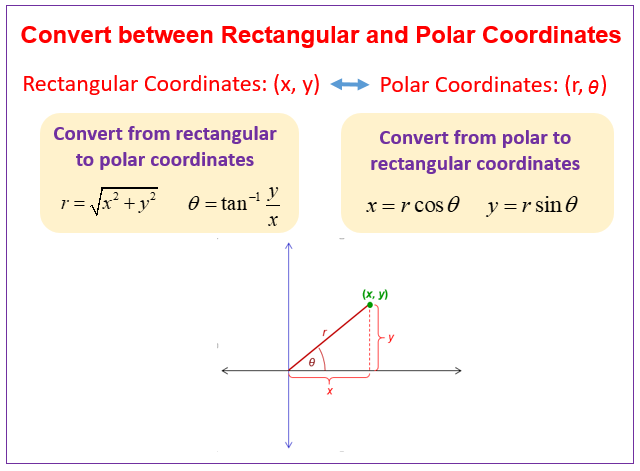 The following diagrams show how to convert between Polar coordinates and Rectangular or Cartesian coordinates. Scroll down the page for more examples and solutions. How to convert the rectangular coordinates of a point into polar coordinates? This video provides two examples of converting a point given in rectangular coordinates to polar coordinates using degrees. This video provides two examples of converting a point given in rectangular coordinates to polar coordinates using radians. How to convert Polar Coordinates to Rectangular Coordinates? It can often be useful to convert polar coordinates to rectangular coordinates. Sometimes operations are easier in one coordinate system than the other. The conversion from polar coordinates to rectangular coordinates involves using the sine and cosine functions to find x and y. It is also important to understand how to convert from rectangular to polar coordinates. This tutorial provides an example of converting a point in polar form to rectangular form. Polar Coordinates - The Basics are discussed. Converting Between Polar and Rectangular (Cartesian) Coordinates, Ex 1. This video gives formulas to convert between polar and rectangular coordinates and does a few examples of going from rectangular to polar form. Converting Between Polar and Rectangular (Cartesian) Coordinates, Ex 2. Converting Between Polar and Rectangular (Cartesian) Coordinates, Ex 3.